Dar Zelij Restaurant : Traditional Moroccan dinner in medina. Of all the riads that Marrakech has restored last 20 years Dar Zelij stands as one of the most remarkable for it’s interior design. The décor is as pure and refined as the table setting and the dishes as delicious as the service is stylish. 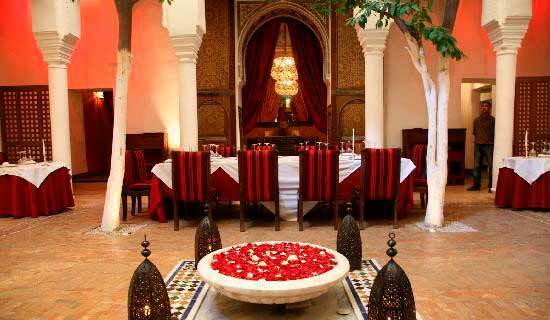 In this superb 17th century riad, which still preserves its original painted ceilings of rare beauty, we have created a unique and compelling atmosphere, luxurious and romantic, for an enchanting journey outside time! The glistening teapots are raised high and the boiling aromatic brew poured into the glasses, the musicians strike a few inviting notes and the round of dishes can begin – be prepared for a veritable treat!